During the !920's, 30's and 40's several Capreol born boys were on their way to becoming NHL players. Even though Capreol produced many NHL stars, some players were left behind for various reasons. Not all potential NHL players had a chance to show their stuff at NHL training camps. With this is mind, teams were formed in Capreol so that these players could play hockey anyway. One of those teams was called the Capreol Millionaires and they played hockey in and around the Capreol area.The Millionaires played in tournaments and defeated many of their out-of-town opponents. Even the powerful Sudbury teams were humbled by this NHL wannabe team. Playing in the 30's during the depression, this team was fittingly called the Millionaires because they were sponsored by several Capreol business tycoons. 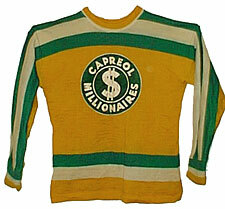 For now, here are the names of some of these Capreol Millionaires players. Alex Nepitt Jr, George Deavy, Belfour Thomas, Elroy Mohns, Bill Napier. I will continue to reseach this team and add names and info as I find it. If you have any info or photos of the Capreol Millionaires please send them to alex@capreolonline.com Thank you. Alex Nepitt.